Retrophile, pattern drafter, uniform enthusiast and perfume buff in Stockholm, Sweden. I love, wear and try to emulate 1930's to 1950's era fashions in the things I make for myself. My own blog has mostly switched to posts in English, with occasional posts in Swedish. I write about style, body image, gender, clothes, fashion, uniforms and sewing from a vintage-lover's perspective, along with the odd post about perfume, music and other odds and ends. I’m finally getting somewhere with my everyday wardrobe. I tend to wear a few favourite garments all the time, and having something like two skirts and three tops that I love to death in constant rotation isn’t really ideal. All those favourites are getting worn out, too. I’m on a complete ban on sewing silly party clothes, with the one exception of a New Year’s gown in sequin seaweed that’s in progress right now, and for once it’s working. I just finished this plaid wool skirt and thought I’d show it off, mostly because pattern matching usually isn’t something I do all that well, but this turned out quite nicely. Nice to know that I can get a fairly large-scale plaid to match well enough not just horizontally but vertically too, in a fitted garment on a figure with a large waist-to-hip ratio. The fabric is a mid-weight wool in a crepe-like, slightly textured weave, and this is a lined seven-gored skirt with five inverted box pleats. The jumper is new too, made from a soft wool knit fabric that I bought years ago and already have two tops in. I have loved and worn them for seven years or so. They’re getting close to worn out now. My mom knit the scarf after a vintage pattern; I’m not a good knitter myself, sadly. I have another meter of the plaid fabric, for a top or jacket of some sort. Haven’t decided on the details yet, but probably a fairly unstructured jacket for indoor wear, so I can wear it like a two-piece dress. Hello, here I am again. I’ve been neglecting my blog and online presence for too long now, but I have been sewing quite a bit, in my defense – and also put myself on a very healthy ban on frantic last-minute sewing of overly ambitious party outfits. My stress levels are down (slightly) and my nerves are thanking me. I’ve been making a lot of things lately, several everyday garments that I need quite badly, but this is the one I’m the most pleased with; a wool/poly gabardine jacket inspired by Steirer jackets and German and Austrian traditional costumes in general, with leather oak leaf appliqués, abstract bakelite acorn buttons and a pleated, skirted back, the cut nicked from a late 1940’s jacket that I have loved almost to pieces. The original sketch made three years ago or so, when I got the fabric. It’s been in the pipeline for several years, in other words, but I’m glad I waited. Front and back panels sewn together, interfaced with horsehair canvas, wool and a heavy linen canvas at the front shoulder, with pockets nearly done. It has bound pockets with the leather oak leaves applied after the pocket was practically finished, but before I closed up the pocket bag. The whole process of figuring out the best order in which to do the pocket and appliqué steps to create fully functional pockets with the appliqué took a bit of frustrating trial and error. I added top-stitched leaf veining after some consideration – it felt like an idea that might go spectacularly wrong, even with a teflon foot, but it actually turned out quite well. Fitting process. The back came together beautifully at once, the front took a lot of fine-tuning. I added a lot (a LOT) of extra hair canvas and wool fabric pieces to the body of the interfacing here and there around the bust and front of the shoulder to get the pocket to lie reasonably smoothly, for instance, and get a nice, smooth shape. It was worth it, and I highly recommend spending some time fiddling around with stiffening, shaping and filling out the silhouette like that if you have the time. I certainly will. Also added horsehair braid along the hemline, from the side pleats in the back, around the curve in front and up to the waist. Also worth it. The finished jacket, with a peaked cap in the same fabric and a new skirt with scalloped button edge. The back is my favourite part of the garment. Right, and I did leather-bound buttonholes on the sleeves, with leather that is not what you’d call thin or supple. That may have been one of the worst ideas I’ve ever had. They look pretty awful up close, but not half as awful as making them was. I wanted to do that on the rest of the jacket as well, but no. Just no. I’ve been wearing it constantly for several weeks now. Very happy with this one. It's not Saint Tropez, but I like it. I bought a two-piece swimsuit a couple of years ago, a pretty red bikini in my proper cup size from Ballet, which really only served to underline the fact that I’m more of a one-piece swimsuit person. I really am not comfortable with two-pieces, and I wanted a vintage-looking swimsuit with full rear coverage and low legs without the hassle of trying to fit my size 34 F/G bust into an actual vintage swimsuit, because come on, let’s be realistic. So. It was clearly time to make one. I made an aborted attempt to build a very structured, fitted suit last year, in a heavy black satin with only 20% stretch or something along those lines, and quickly realized that I don’t actually want a swimsuit that I need to be hooked and zipped into. This year I went with regular old lycra swimsuit fabric instead, and since I’m lucky enough to live in a city where there’s a specialised shop for lingerie, dancewear and swimwear fabrics and notions, I got to choose between about a hundred different colours. (“And you chose the snot green? Really?”) I like green, I like chartreuse, I liked the chartreuse better than the available dark greens, and I didn’t want tropical colours or the usual suspects black, blue or red. Cup drafting is intimidating and I’m not very happy with any of my current cup drafts, so the bust pattern is based on Mrs Depew’s 50’s French pinup bra and adapted a bit. The cups are cut from two layers of the same swimsuit fabric fused together, which does give it a lot of extra stability, and I made reinforced shoulder straps that start from the side of the cups, cross in the back and button to the top of the cups, which keeps everything neatly in place and provides a bit of support. Full cups and minimal cleavage, which is how I like it. You might get an idea of the stability the fused double layers of swimsuit fabric add. For the rest of the suit I looked at an old favourite swimsuit of mine, which is sadly worn to the point where it’s coming apart, and drafted the thing with side seams only, a hint of legs and a fairly wide crotch piece. Most swimsuit bottoms and underpants fit my large behind very badly and ride up, this cut seems to do the trick; it does give the full rear coverage that I want, and then some depending on how low on the hips and thighs you make the bottom edge, it’s comfy, it doesn’t have one of those nasty center front seams, and it stays firmly in place. I love it. The finish of the suit is not what I’d call pretty. I dislike working with knit fabrics – because I’m not good at it, frankly – and I was in a hurry. Call it a test run that turned out wearable, but not perfect. I do like the black plastic anchor buttons, and the bust got some fairly sloppy black satin piping which helps the look, too. But the important thing is that it’s actually a comfortable, serviceable and fairly well-fitting swimsuit that I don’t have to zip myself into. I really enjoy making small cocktail hats and other heavily decorated things to wear on my head. It’s the perfect pleasure project, in many ways; I can whip them up quite fast, usually these things come together for specific parties, they generally don’t require a lot of material, there’s very little fitting, lining and other time-consuming work involved, and it’s fun. It’s as free of performance anxiety as sewing ever gets for me, and it feels festive and playful and exhilarating. I’m not shy about wearing odd stuff on my head, either, so the sky’s the limit, really. For New Year’s, there was a grand masquerade, and for that you need a mask. I also needed a red sequin evening gown, but the red sequin seaweed fabric got lost in the mail and didn’t arrive until yesterday. Oh, well. 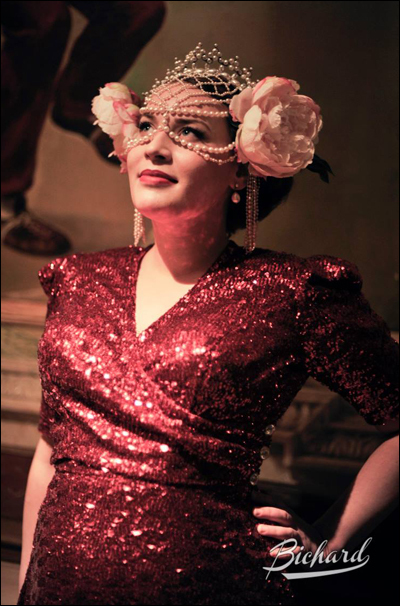 Another party, I made a sequinned and beaded red half mask in the shape of a gloved hand anyway – I’m a huge Schiaparelli fan, I love mildly surrealist headwear, and oddly enough my wardrobe didn’t contain a decent mask before this one. I went through a lot of paper copies to get the shape right. The original idea was to use a lonely actual red leather glove, but that turned out a bit too bulky; I think I’ll try to make a hat out of it at some point instead. So I sketched, cut, folded and ended up with a decent pattern of sorts, which I cut and shaped in this heavy linen/horsehair interfacing. There are two darts in it, so that it follows the curve of the head. …and covered the base with plain red cotton poplin, and the inside with peach satin. Outlines of the fingers and glove stitching on the back of the hand marked out, too. This was the fun part, really. And then I covered the whole thing with sequin ribbon, for plain areas, and red glass seed beads, for contours, shades and outlines. …I think it worked rather well, anyway. I added a couple of rows of tiny black seed beads to stress the outline of the fingers after this, but it doesn’t make much of a difference; there’s just a little bit more of a contour. It fastens in my hair with four of those little toothed metal clips that are often used on clip-in hair extensions, you know – those are the best thing there is for attaching things securely to hair, even short hair. This wasn't my first glass of champagne. And then I wore it, with a marvellously vulgar 50’s dress that I got for New Year’s two years ago. I think it turned out quite well. Hello everyone! It struck me the other day that I’ve been rather productive this year, and I haven’t posted here in ages. This is part of what I’ve been up to. – Another fictive uniform, because apparently I need more of those. I found a wonderful olive drab Prada cotton twill that feels more like a wool suiting, soft with a nice drape to it, bought less than I should have and managed to scrape a short jacket with sleeves to just past the elbows, a plain skirt and a small side cap out of it. It’s finished off with WWII American Red Cross bakelite buttons, and the embroidered Red Cross armband is German. The skirt is lined, straight with a very slight flare at the bottom that doesn’t show up in this photo, and the jacked is lined with the interfacing, so to speak, a heavy black linen. I wanted this one to be cool and breathable, but still rather structured. At some point I should take out the sleeves and mess around a bit with the fit in the area around the armhole in front, it’s slightly too wide and loose there, but that’s a later project. Off-white wool/poly blend, red cotton and galloon. And then I made another one for a party, a Victorian circus-themed burlesque night. I don’t really do Victorian right now, so I made a cigarette girl kind of outfit; in part because I like the way they look, and in part because I have a ton of vintage Swedish military gold galloon – those heavy gold bands, you know – that I wanted to try out. In the end I was appointed lion tamer, too, so no cigarette tray. Back of the jacket during the fitting process. So. Short, fitted jacket with a stand-up collar, puffed elbow-length sleeves and a pleated peplum in the back, short circle skirt and a pillbox hat, simple enough. I put a lot of heavy interfacing in the front of the jacket to carry all the metal the galloon contains, a very heavy vintage linen/horsehair interfacing fabric I found a roll of ages ago, and ended up flatlining everything with white cotton muslin to counteract the slight transparency of the loosely woven wool blend. The jacket is lined with red cotton. The skirt is unlined, although interfaced with the same white cotton as everything else, and has side seam pockets that aren’t as well hidden as I would have liked. I didn’t want to have to carry a bag, what with the lion and all; she was rather frisky and became completely unmanageable by the end of the night. She did win the costume contest, though – unfortunately the prize was a bottle of champagne, which lasted about a quarter of an hour, but still. ...and the end result. Prize-winning lion and lion tamer. I’ve actually never made a pillbox hat before, although I’ve dabbled with hat-making quite a bit, but it has to be fairly straight-forward, right? Simpler hat shapes are hard to think of. I still have a large piece of extra-thick red felt left from the shoe hat, so I used that for both hat sides and top. Ended up cutting down the size of the thing quite a bit – I measured one of my favourite hats, a simple 40’s sailor hat, and used the same height and circumference for starters, but it turned out way too large. I flatlined the main fabric with white cotton, sewed the two pieces together, pressed and made sure the stiff felt pieces fit well into it. Then I added the galloon to the outer layer, hand-basted the felt pieces together, pushed them well into the outer layer, tucked the seam allowance into the hat and sewed it to the inside. It all stays in place with a comb attached to the bottom edge. I will definitely be making more pillbox hats in the future, they’re easy, flattering and satisfying. This was a fun project.